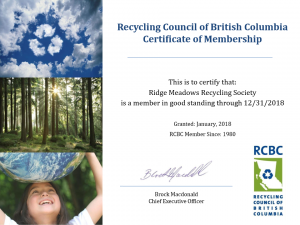 Ridge Meadows Recycling and the City of Maple Ridge have been working together to provide recycling services in Maple Ridge since 1972. In 1997, we entered into a formal partnership agreement working together for a better environment. Community Living BC (CLBC), formerly part of the Ministry of Children & Families, funds our Supported Work Program. This funding allows us to provide a positive work site where people with a variety of skills and abilities can experience success in a work setting. We acknowledge the financial support of the Province of British Columbia. The Province of British Columbia offers Community Gaming Grants to non-profit organizations “providing programs or services of direct benefit to the broader community.” We are very grateful for these funds and the work they allow us to do in the community. In 2018, we launched Maple Ridge Repair Cafes with funding from the New Horizons for Seniors Program Grant provided by the Government of Canada. We are so grateful for the support from many organizations and individual volunteers that can bring this exciting project to the community! Other organizations we work with include the Recycling Council of BC, Metro Vancouver‘s Municipal Waste Reduction Coordinator’s Committee, the City of Maple Ridge’s Environmental Advisory Committee, and the Life After School Transition (LAST) Committee. Interested in becoming an RMRS sponsor? Give us a call at 604-463-5545 – we’d love to hear from you!